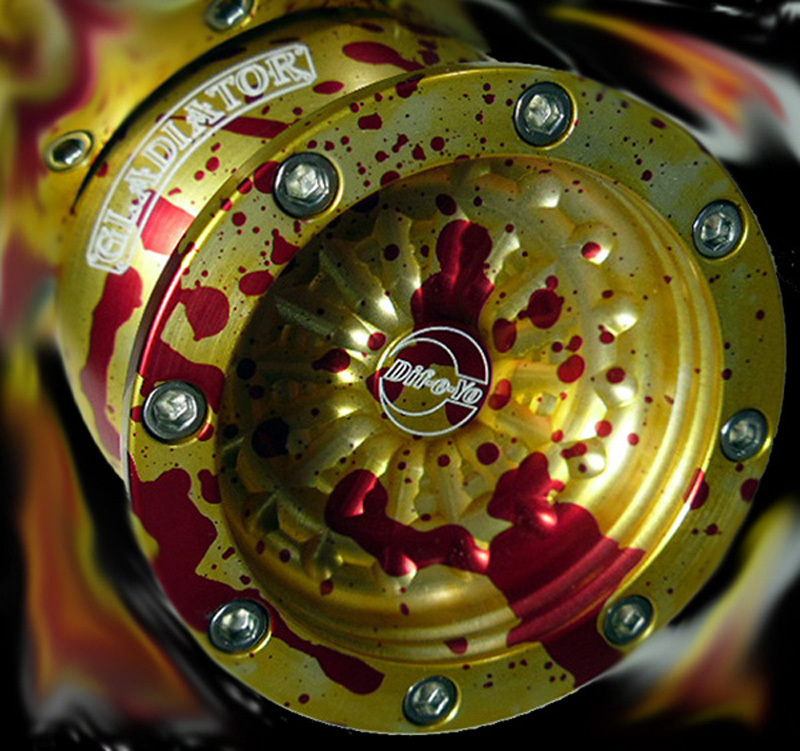 See the Dif-e-Yo " GLADIATOR SLAVE "
Dif-e-Yo KonKave bearings available in 4 sizes. Check your favorite internet store for availability. This Limited run Model is sold out. But available is the IT Player model. See info & pics on the yo-yos page. using a Dif-e-yo Bare Bones yo-yo at the 2005 Worlds yoyo Contest. 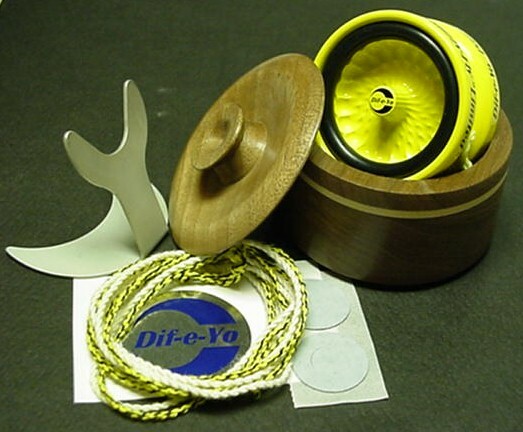 A Dif-e-Yo is a Custom hand Crafted product that is not produced solely with machines. Designed and manufactured through a combination of machining and hand work. which involves hand polishing and cleaning before assembly. After assembly each yoyo is tested before it is packaged for shipping. Patented Dif-e-Yo KonKave Stainless Bearing! Dif-e-Yo KonKave bearings now in 3 sizes! 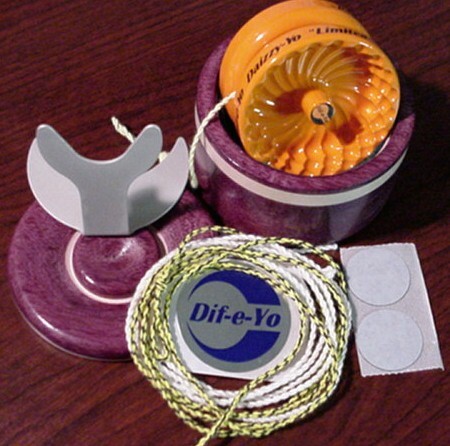 Dif-e-Yo KonKave Kit for large bearing YoYo Jam yoyos. .250 ID x .188 wide x .500 dia. bearing and 3 sets of shims. clicking on the name to be redirected. 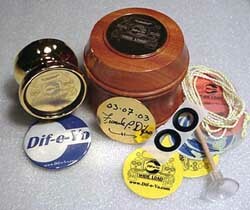 all Dif-e-Yo yoyos now have Flush Dif-Pad response. Made in the USA with the player in mind. Short on Frills and your wallet...but Long on performance. 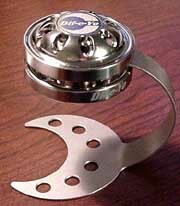 To Buy a Dif-e-Yo yoyo of your choice..
Sportster hit's the road with.. Comedy, Magic, Hypnosis, Juggling, and YO-YO tricks. 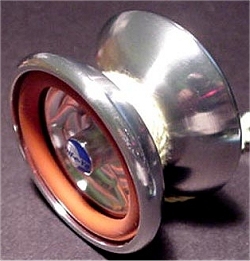 Amazing Arthur uses a Dif-e-Yo Sportster for his main yo-yo in his act. Sold out models below are "LIMITED" Models available in the past. A small quantity of 7-10 "LIMITED" yoyo's are made for each run of 55 Collector models but are Unique with their own Custom Accessories and finishes that may be anything from a limited color to 24K Gold plating. As with the Collector model, Limited packages include Extra String, Stands, and various Exotic Wood Custom storage Boxes. ONLY 11 made - Signed and dated. Set up with a Grooved bearing and Friction disc response system. This package comes with everything you see in the picture above! Mahogany Wood storage box with 24K gold plated laser engraved insert in the lid. This box is Exclusive with these "Limited" yoyo's. Each box is slightly different. No two are the same! Only 7 made in Powder Coated Florescent Orange. This model has a performance mod to the friction disc response system and sports a .100" string gap and Dif-e-Yo Grooved Bearing. 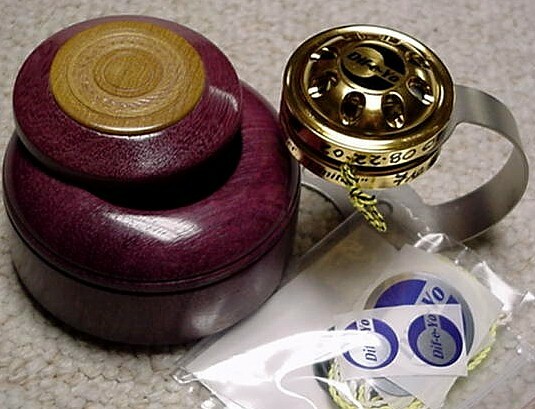 Purple Heart Wood storage box is Exclusive with these "Limited" yoyo's. Each box is slightly different. No two are the same! Only 10 were made in Powder Coated Florescent Yellow with a new visual design from the Original Daizzy-Fly. It sports a .120" string gap with Stainless Steel axle and Dif-e-Yo Grooved Bearing. This model uses a friction disc response system. Walnut Wood storage box is Exclusive with these "Limited" yoyo's. Each box is slightly different. No two are the same! See Yo-Yos or Custom Work page for more info.